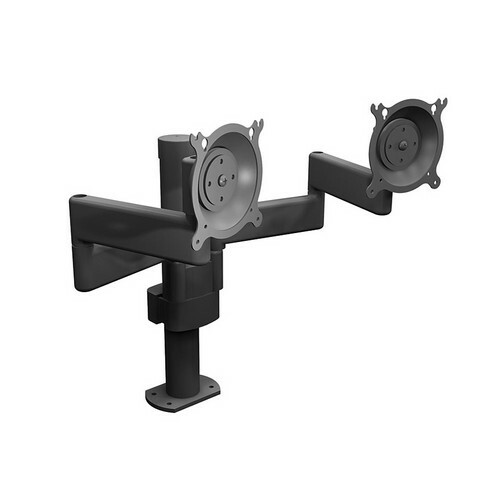 The Winsted W5696 15" Pole Mount with Dual 15" Extension supports 2 LCD displays and attaches to Sight-Line's Versa-Trak mounting system. Along with a teardrop hole pattern that allows quick and easy mounting of the screens, the mount also features integrated cable management. You can use the mount for LCD display, each weighing up to 30 lb (13.6 kg). A 15” (38.1 cm) pole offers enhanced stability, while the 2 dual swing arm mount provides a broad range of motion (15" extension) to view the LCD display from multiple angles.